A form of mitochondria-to-nucleus signaling is known to play a role in determining replicative life span in yeast. This retrograde response is triggered by experimentally-induced mitochondrial dysfunction , but it also is activated during the course of normal replicative aging, allowing yeast to have as long a replicative life span as they do. The components of the retrograde signaling pathway participate in diverse cellular processes such as mitophagy , which appear to be involved in mitochondrial quality control . This plethora of mitochondrial surveillance mechanisms points to the central importance of this organelle in yeast replicative aging. Additional pathways that monitor mitochondrial status that do not apparently involve the retrograde response machinery also play a role. A unifying theme is the involvement of the target of rapamycin (TOR ) in both these additional pathways and in the retrograde response. The involvement of TOR brings another large family of signaling events into juxtaposition. Ceramide synthesis is regulated by TOR opening up the potential for coordination of mitochondrial status with a wide array of additional cellular processes. The retrograde response lies at the nexus of metabolic regulation , stress resistance , chromatin-dependent gene regulation , and genome stability . In its metabolic outputs, it is related to calorie restriction, which may be the result of the involvement of TOR. Retrograde response-like processes have been identified in systems other than yeast, including mammalian cells . The retrograde response is a prototypical pathway of interorganelle communication. Other such phenomena are emerging, such as the cross-talk between mitochondria and the vacuole , which involves components of the retrograde signaling pathway. 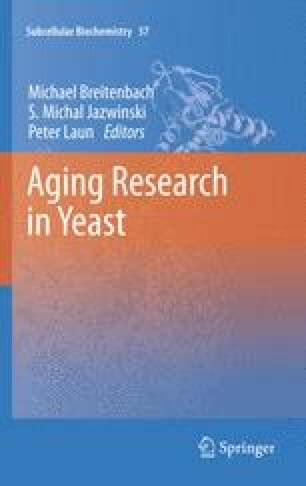 The impact of these varied physiological responses on yeast replicative aging remains to be assessed. The research in the author’s laboratory is supported by grants from the National Institute on Aging of the National Institutes of Health (U.S.P.H.S.). The support of Heinz Keller of Schwarzwald, Switzerland is gratefully acknowledged.